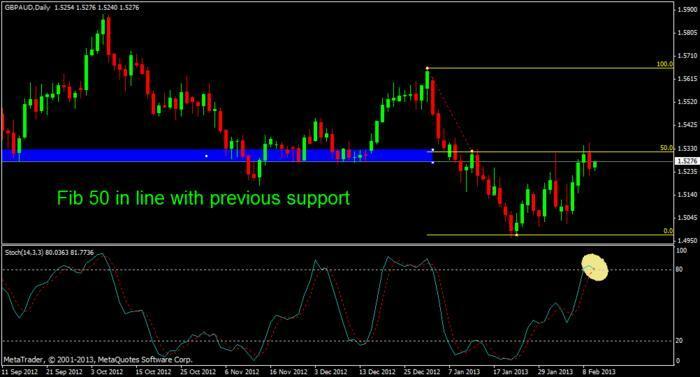 GBPAUD in a potential fib level. Pair reacted to the fib level and is going down quickly. Looks like the comdoll bulls are strong around the falling channel resistance on the 4-hour chart. If it breaks, the next possible support is near the 1.0400 handle and former trend line support. 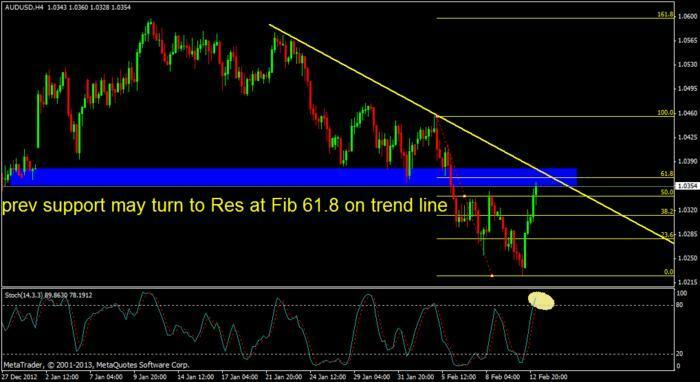 Waiting to Short AUDUSD at trend line (which is in line with Fib 61.8 level and previous support) on some candle stick confirmation. 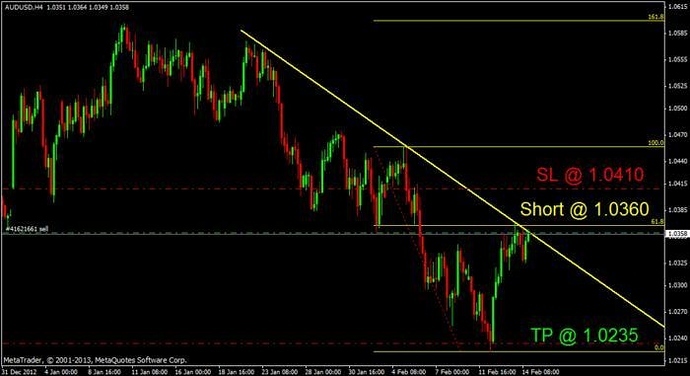 Based on my previous post as above, I am entering on my next AUDUSD trade. Took this trade for the exact same reason to and its working. 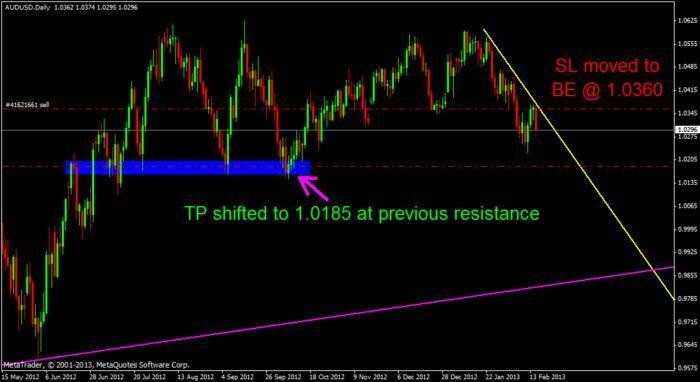 My AUDUSD short trade is presently up by 60 pips and so I am moving the stop Loss to BE at 1.0360. 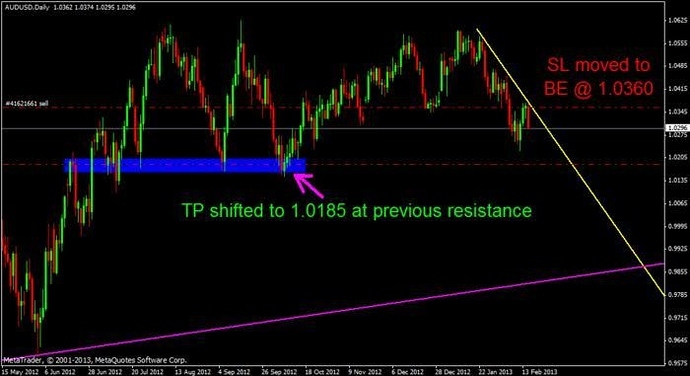 Also I am extending the TP to 1.0185 from 1.0235 as 1.0185 area was a strong support area previously as given in the below daily chart. While you’re wondering why the 4h falling channel is breaking, it’s probably because a RISING channel is starting to form on the lower time frame. AUD/USD is about to reach the 1.0350 handle, which is near the mid-channel resistance on the 1-hour chart. 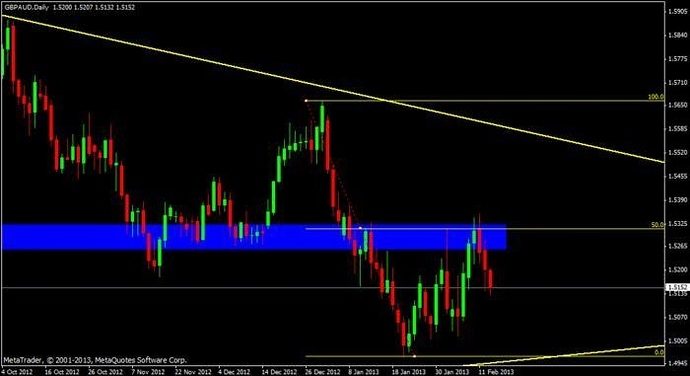 Think this setup will hold till the end of the week? 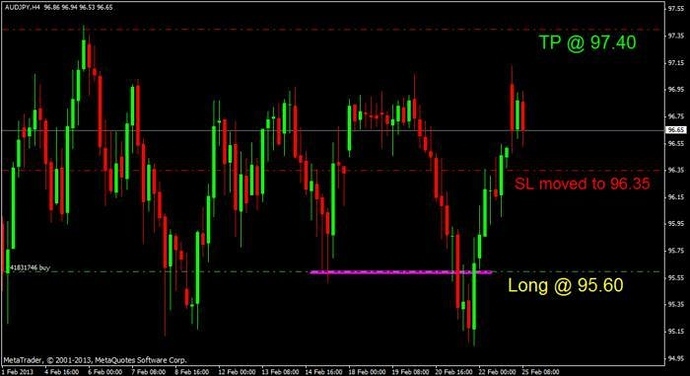 Good job shorting the Aussie, Bijoy, bobmaninc, and NickB34! 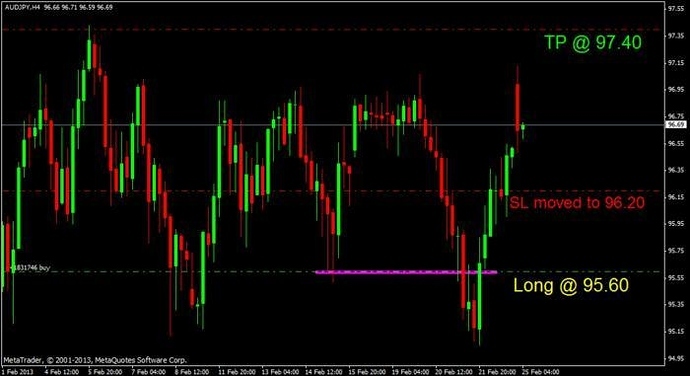 I have a friend who also got 30 pips on the same setup. What do you think of the ascent on the 1h though? Retracement or reversal? 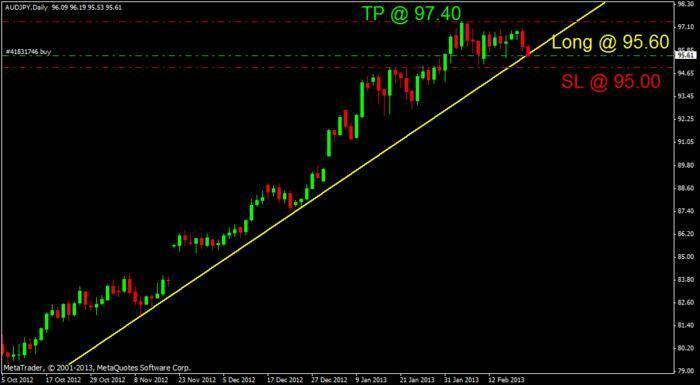 Seems it is only a retracement. I am expecting the higher low formed recently may break to new lower lows. Thanks Happy. 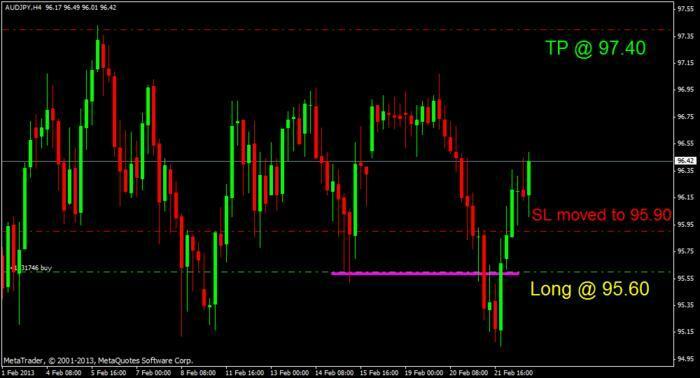 Only got a few pips from it this time, not really my timeframe to be honest, I like to think bigger! Not sure it’s a reversal, I’ve still got my sights on 1.01 or maybe 1.00. Waiting for some confirmation of that mid channel resistance you’ve pointed to on the 1h then I’ll dive in short again. 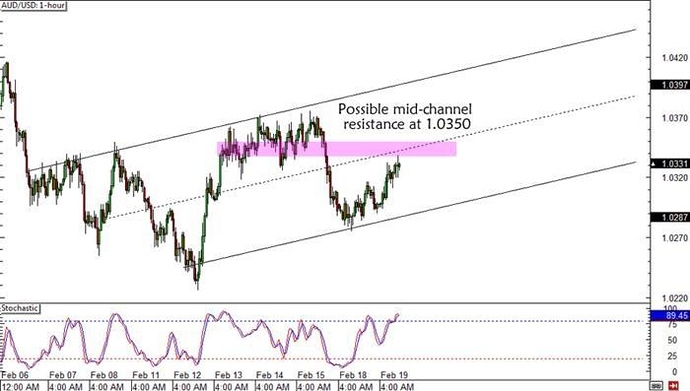 Are you still thinking long on this pair heading up past 1.06? Went long on GBPAUD at weekly trend line. 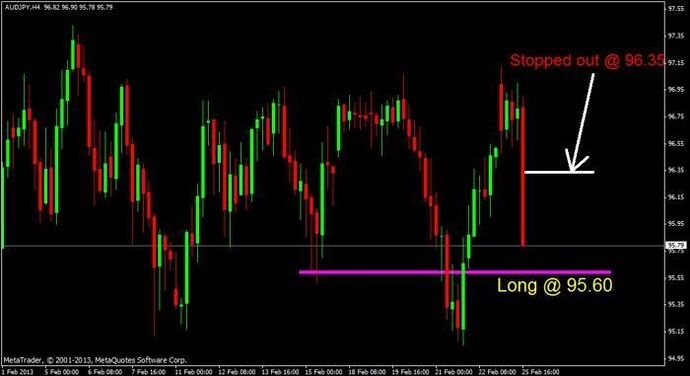 A long trade was entered on AUDJPY few hours ago at 95.60 and here is how that order was placed. Currently the long AUDJPY trade is up by 80 pips and so moved SL to 95.90 locking 30 pips. Currently the long AUDJPY trade is up by 80 pips and so moved SL to 96.20 locking 60 pips. Making stop loss of my AUDJPY long trade little more tight by moving to 96.35 locking 75 pips. 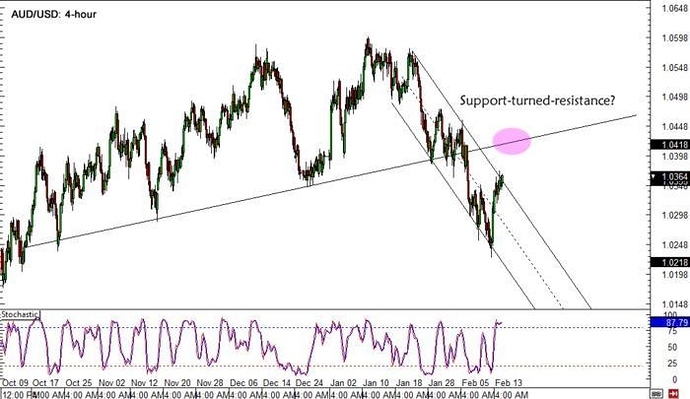 Is a bounce in the cards for AUD/USD? 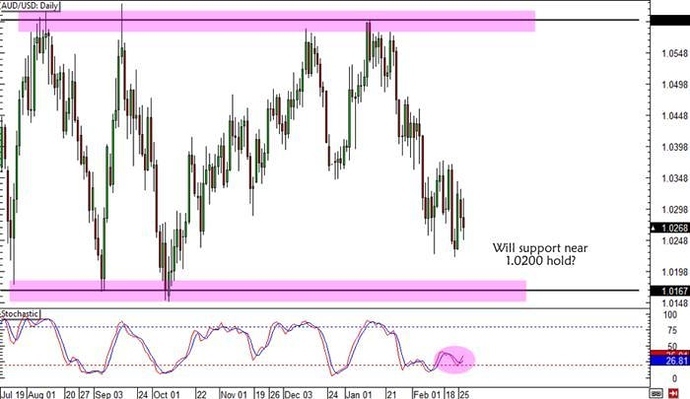 Looking at the daily chart, it looks like the pair is approaching a significant support zone near the 1.0200 major psychological level. Stochastic has made its way out of the oversold region, suggesting that Aussie bulls might have the upper hand soon. If the pair is able to bounce and sustain its rally, it could even go as high as the 1.0600 handle!